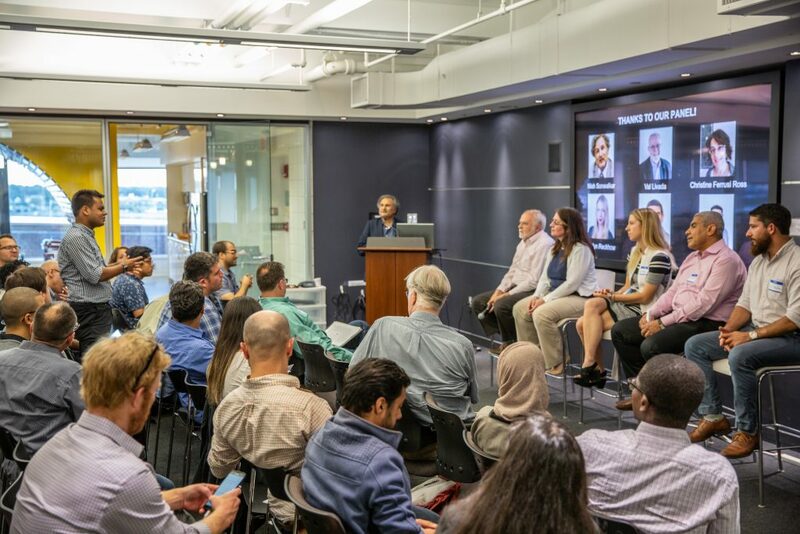 BOSTON, MA — Energy professionals, blockchain enthusiasts, and market insiders gathered on the campus of UMass Boston on Thursday, where a panel of experts moderated by Dr. Nish Sonwalkar fielded questions on the potential disruption of the energy industry by budding blockchain technologies. 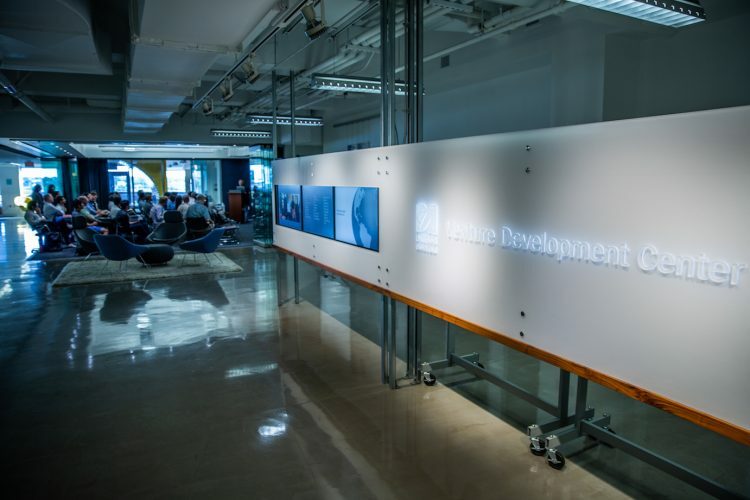 The University of Massachusetts Boston’s Venture Development Center is an incubator that has housed companies attracting over $693 million in investment, including Power2Peer. After a brief introduction to the space by Founder and Director William Brah, Power2Peer Founder and Chief Evangelist Dr. Nish Sonwalkar (ScD, MIT) took the stage to present opening remarks and introduce the panel. Dr. Sonwalkar opened with a brief overview of blockchain and its potential to reshape a wide variety of industries. Its versatility as a secure and decentralized ledger has been quickly adapted to both open source and private platform settings, with applications ranging from financial industry use cases to supply chain tracking. In March, Greentech Media reported that energy blockchain ICOs had raised $324 million between Q2 2017 and Q1 2018. For the energy sector, blockchain presents a key opportunity to “topple the monopolies held over grid operation and energy distribution by a handful of corporations,” Dr. Sonwalkar said. Sonwalkar then introduced his five panelists, who presented some brief remarks of their own before opening a dialogue guided by a series of questions from the moderator. Dr. Val Livada, who has been observing and participating in tech, energy, and venture industry trends for four decades, commented that while the future of the grid is hard to predict, distributed energy and blockchain are technologies that clearly have the attention of industry giants. “If you look at companies like Siemens and Schneider electric, they have more invested in distributed energy now, so it seems like they’re betting big on it,” Livada said. When asked for her take on the state of blockchain as it applies to energy distribution, market strategist and blockchain expert Christine Ferrusi Ross highlighted the capacity of blockchain to not only provide consensus but protect privacy. “Some of the challenges with energy involve on the one hand validating the identity of IoT devices, while also obscuring identity data in order to protect privacy and the security of individuals,” Ferrusi Ross explained. Also speaking on how blockchain technology is well-suited to address problems of the energy sphere was blockchain evangelist Carolyn Reckhow, Head of Operations and Client Services at Casa, Inc.
Wafik Farag, a management consultant with decades of experience in the energy sector, emphasized the risk inherent in our deteriorating grid infrastructure, pointing to the billions lost as a result of the severe blackout of 2003, which affected most of the northeastern United States. As for the ability of blockchain to address issues of grid infrastructure and the proliferation of clean energy, Alan Robertson, “make-it-real guy” and Director of Business Development at BlueWave Solar, expressed optimism about the technology. Taken together with automation, Robertson suggested that blockchain could help in expediting the process of constructing solar arrays. One pressing challenge is to achieve a more complete integration of the disparate technologies which together would have greater impact in reducing carbon emissions, not only by promoting cleaner generation, but by curbing consumption. Following Dr. Sonwalkar’s questions, attendees were offered a chance to ask some questions of their own. One notable guest to enter the discussion was NECEC VP and previous Power2Peer panelist Alistair Pim. Given the opportunity to listen to this diverse array of experts discuss such issues at the frontier of innovation, it seemed that there was indeed something for everyone to take away. 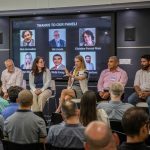 The tangible enthusiasm which brought together such an energetic group of people bodes well for the future of the energy blockchain in Boston. It is a future that to be realized will require forward-thinking, organization, and community networking; a future in which Power2Peer plans to play a central part.